The 36-year-old is one of the best tennis players in the world, so why is she underappreciated? Shortly after defeating No. 1-ranked Angelique Kerber in the Miami Open quarterfinals on Wednesday, Venus Williams found her father, Richard, to share her joy over the 7-5, 6-3 victory. It was her 15th career win against a No. 1 player and her first in three years. Richard Williams gave tennis two of its greatest gifts in his daughters, who have dominated the scene for a little over two decades. He shielded his daughters from the harsh realities of growing up in Compton, California, while instilling in them the ability to dream big and focus on becoming the best tennis players they could be. Forty-nine WTA singles titles and 22 doubles titles. A combined singles and doubles record of 929-178. Seven Grand Slam singles titles. One of the top 20 players in the world with a current No. 12 singles ranking. 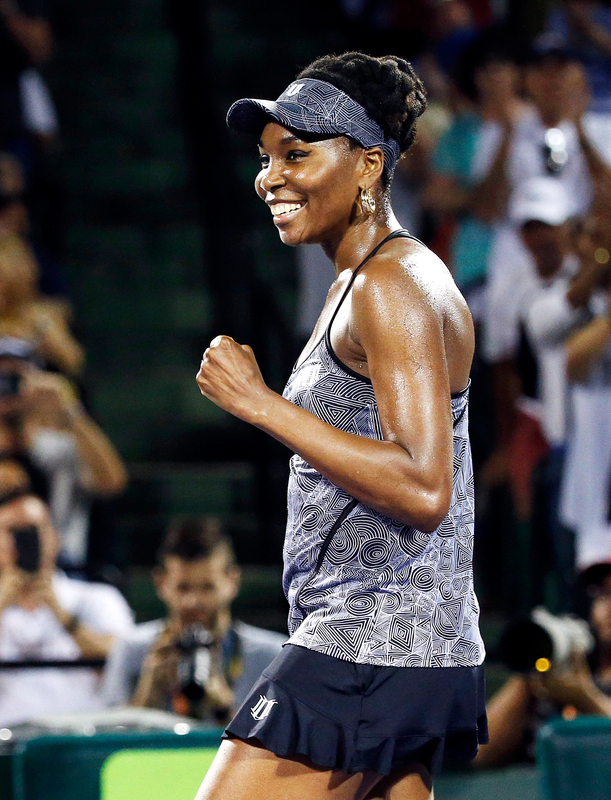 Venus Williams of the USA reacts after defeating Angelique Kerber of Germany following their quarterfinal match at the Miami Open tennis tournament on Key Biscayne, Miami, Florida, USA, 29 March 2017. She lost Thursday at the Miami Open, so the victory over Kerber will get some applause. There will be a few write-ups about the touching moments shared between father and daughter and at least one mention of her as an underdog. Then deafening silence. Williams isn’t getting nearly enough of the credit she deserves. For the longest time, Williams was the face of African-American female tennis players. This is a fact that younger sister Serena never forgets. Through the years, countless interviews, intoxicating highs and soul-crushing lows, Serena Williams has always been adamant about letting the public know that her big sister is the one who created the Williams legacy. “There’s no way I would be at 23 without her,” Serena Williams said after beating her sister in the Australian Open to win her record-breaking 23rd Grand Slam in January. “There’s no way I would be at one without her. There’s no way I would be anything without her. It’s a fact often forgotten when it comes to the Williams sisters. Though the pair are only a year apart in age, it was Venus Williams who made a name for herself and paved the way for Serena to shine through the good, the bad and the ugly. Although the Williams sisters aren’t the first black women to dominate tennis, they are the face of today and remind us that racism and prejudice are still very much alive, and sometimes boldly expressed, when they step onto the tennis court. In January, Venus became the oldest woman to reach the Australian Open semifinals. At 36, she continues to play very well for the love of the game and against her biggest competition: herself. We often forget Williams’ heart and her ability to play through not only her diagnosis of exercise-induced asthma but also Sjogren’s syndrome, an autoimmune disease that causes fatigue, aching, swelling and debilitating joint pain. It’s a subject Williams never shied away from. She discussed the disorder in ESPN The Magazine’s Body Issue in 2014. “I realized I can still perform, but all the stuff that I used to do and train and just be superhuman, there’s no need,” Williams said during the interview. “I can still win and compete and be amazing without having to drill myself into the ground, which I used to love to do. So salute Venus Williams, a powerful black woman who isn’t afraid to fail, who laughs through the pain, who shows nothing but love and support for her little sister, who continues to paint the court with her own #BlackGirlMagic, unapologetically, for all to feel and witness.